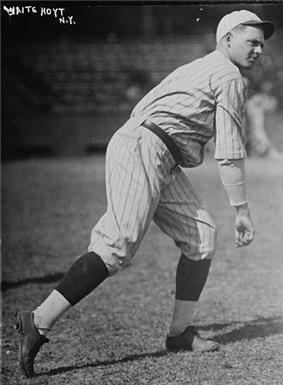 Waite Charles Hoyt (September 9, 1899 – August 25, 1984) was an American right-handed pitcher in Major League Baseball, one of the dominant pitchers of the 1920s, and the winningest pitcher for the New York Yankees during that decade. He was inducted into the Baseball Hall of Fame in 1969. After a brief stint with the Giants, McGraw sent the young pitcher to the minors for seasoning. Hoyt soon returned to the majors, this time with the Boston Red Sox. His performance there attracted the attention of the Yankees, who acquired him in 1920. In his first season as a Yankee, he won 19 games and pitched three complete games in the World Series without allowing an earned run — over his career, he would win six American League pennants with the Yankees and one with the Philadelphia Athletics. In his finest years with the Yankees, 1927 and 1928, Hoyt would post records of 22 wins and 7 losses with a 2.64 ERA and 23 wins and 7 losses with a 3.36 ERA. During his 21-year career, he won 10 or more games 12 times, 11 of them consecutively. Hoyt pitched for eight years after leaving the Yankees in 1930, but did not consistently display similar levels of pitching dominance. Hoyt finished his career with a win-loss record of 237–182 and an ERA of 3.59. By the time he retired in 1938, he was the winningest pitcher in World Series history (his World Series record with the Yankees and A's was 6-4). In addition to the "Schoolboy" moniker appearing on his Hall of Fame plaque, Hoyt was also known as "The Merry Mortician", for when he was not playing baseball, he spent days working as a funeral director and nights appearing on vaudeville. As a vaudevillian, he appeared with many of the most well-known performers of the day, including George Burns, and others. He kept in shape during the off-season by playing semi-pro basketball. He added to his repertoire by becoming an accomplished painter and writer. On August 16, 1948, Hoyt paid tribute to Babe Ruth, speaking on the air without notes for two hours upon learning of his death after a game. He was well known as the pre-eminent authority on Babe Ruth, who was his teammate for almost 10 years. Robert Creamer, author of the definitive Ruth biography Babe, indicated in that book's introduction that the novella-length memoir written by Hoyt shortly after Ruth's death was "by far the most revealing and rewarding work on Ruth". A longtime member of Alcoholics Anonymous, during the 1978 Old-Timers' Day game, Hoyt said wistfully that he would have won 300 games if he had stopped drinking during his playing days. After joining A.A., he remained sober for more than 40 years. Dodgers' voice Red Barber, however, thought more of Hoyt's abilities and hired him as color commentator and host of the pre- and post-game shows in 1940. After two years, he became the play-by-play voice of the Cincinnati Reds, a post he held for 24 years. He became as much a celebrity with the Reds as he was while a player. He was well known for calling games exclusively in past tense, which was and still is unusual for sportscasting. Where most baseball announcers would say, "Here's the pitch!" Hoyt would say, "There was the pitch!" He told author Curt Smith that he felt using past tense was accurate because "as I speak to you, what happened a moment ago is gone." He retired from full-time broadcasting work in 1965, though he later made appearances on both radio and television, including the color commentary for the Reds telecasts in 1972. Hoyt was known for entertaining radio audiences with anecdotes during rain delays. A selection of these stories is collected on two record albums "The Best of Waite Hoyt in the Rain" and "Waite Hoyt Talks Babe Ruth". Hoyt was one of the first professional athletes to develop a successful career in broadcasting and his name frequently appears on "all-time best" broadcaster lists. On June 10, 2007, the Reds honored Hoyt, Marty Brennaman, and Joe Nuxhall with replica microphones that are hung below the radio broadcast booth at Great American Ball Park in Cincinnati. An eternal optimist, Hoyt married his third wife, Betty Dearie in 1982. Dearie, a longtime fan, was an associate of Warren Giles, first President of the Reds and subsequently of the National League. Betty still lives in Cincinnati and was interviewed extensively in the video biography "Waite's World". The bio was released on VHS in 1997 and includes interviews with his son Chris, the late hall of fame broadcaster Joe Nuxhall, reporter and television personality Nick Clooney, and retired Reds pitcher Jim O'Toole. The aging Hoyt died of heart failure while preparing for what he realized would be his final visit to the Hall of Fame, in Cooperstown, New York. Hoyt is interred in Spring Grove Cemetery in Cincinnati.